What is the Craftsbury Dark Fiber Network? The Craftsbury Dark Fiber Network (solid lines on map) is roughly 13 miles of fiber-optic cable connected to the state-owned NEK Dark Fiber Network (dotted line). Construction is currently ongoing and should be complete by early May 2018. By then, the Town will have leased space on the network to an internet service provider (ISP) through a competitive process. That ISP will be able to provide reliable, extremely highspeed internet and voice services directly to homes and businesses via fiber. 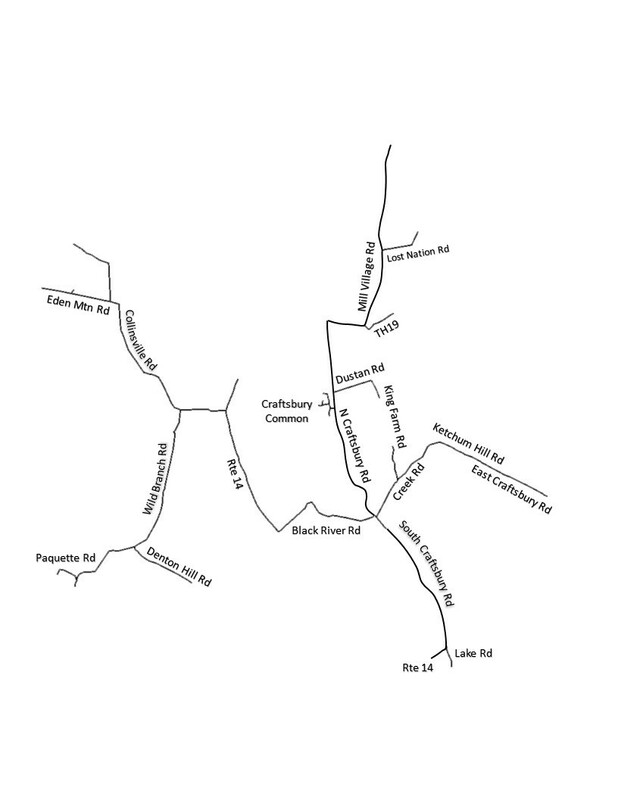 Almost half of all addresses in town are along these routes. Hookups and service will begin as soon as possible, most likely by early summer. Where exactly is the fiber route located? * Fiber extensions are being constructed by Pear Networks with a grant from the state: Collinsville Rd. (+ .35 mile, ~ 1,900 ft.); Eden Mtn Rd. (+ .51 mile, ~ to Eden line); Wild Branch Rd. (+ .86 mile, to Glenn Anderson Loop); plus G.A. Loop, Paquette Rd. to Bailey Rd. What is Pear Networks/Kingdom Fiber? How were these routes chosen? The Craftsbury network was funded largely by two federal grants intended to support economic development. Route design followed grant requirements by prioritizing areas with the greatest density of businesses. In some cases, lower-density sections had to be traversed in order to connect higher-density segments. Wasn’t this network supposed to be built last year? Yes. We had expected to begin construction last summer/fall and hoped to be active by the end of 2017. Unfortunately, upgrades to utility poles in town needed to support the additional wires were not completed in a timely manner. As a result, our schedule was delayed by approximately six months. What level of internet services will be available via the network? Fiber-optic cable is the fastest and most reliable data delivery technology currently available. The Town expects the successful ISP to be able to offer residences and businesses along the routes plans with data speeds from 10 Megabits per second (Mbps) downstream and 2 Mbps per second upstream up to “future-proof” 10 Gigabits per second (10,000 Mbps) both down and up. Affordable voice services over the internet should also be available for purchase. The Town intends to lease space on the Craftsbury Dark Fiber Network to an ISP that will offer services that are competitive with other currently available broadband offerings. Will there be a connection fee? It is standard practice for an ISP to charge an upfront fee to partially cover the cost of installing its equipment. This fee is generally sliding, based on the length of the service contract. The Town intends to ensure that these fees are in line with industry norms. Is there any assistance available? Yes. There are limited funds to help small businesses pay for connecting to the new fiber network. Part of the USDA grant will provide at least a dozen free standard connections to qualifying businesses. Download this free new fiber network hook-up application for businesses here. The form must be returned to the town office by April 30. Will there be ongoing costs to the Town of Craftsbury? No. The Town was awarded $99,950 from USDA Rural Development and $212,403 from Northern Border Regional Commission to construct the network. The Select Board committed $25,000 of town dollars as matching funds for the grants. This is a one-time cost. There will be ongoing annual expenses related to the network including pole license fees. These costs will be paid for by the ISP directly or will be covered by lease payments. What about the rest of Craftsbury? The Craftsbury Cell & Broadband Committee will continue to evaluate options for improving internet service to the parts of town not directly on the fiber network. It is possible the network ISP or a different ISP will be able to provide better, faster service through new wireless technology. There also may at some point be a way to raise additional funds to extend the network. Expanding cell service widely in Craftsbury has proven to be a more challenging problem than broadband. New technology may change that. For now, the committee plans to investigate the possibility of using the new fiber network to set up cellular “hotspots” in the villages.